THERE IS NO PAUSE IN GLOBAL WARMING! We Keep Hearing Global Warming Has Paused? THERE IS NO PAUSE. There seems to be significant confusion on the issue of human caused global warming because some say that the warming has stopped, or paused. Let me be clear. THERE IS NO PAUSE IN GLOBAL WARMING! This is proven in the measurements. The system is coupled and complete in all respects. The cryosphere consists of sea ice, land ice, and snow, which can be found in/on the ocean, or on land (glaciers and snow). "The World Ocean accounts for approximately 93% of the warming of the earth system that has occurred since 1955." Further work constrained these estimates down to an estimated 90%. The process of science is to to test it's conclusions and continually refine models in order to determine the level of confidence in the science. While there is high confidence in the 90% estimate, we can expect further refinement in the estimate as the science continues to improve. The relevant conclusion here is that there is high confidence that the majority of trapped energy is going into the oceans. Note: The process of science is to increase confidence in the conclusion. This is typically achieved through the discovery of problems in the science. In other words, to improve, science must be critical of itself. IPCC AR5: Ocean warming dominates the increase in energy stored in the climate system, accounting for more than 90% of the energy accumulated between 1971 and 2010 (high confidence). It is virtually certain that the upper ocean (0−700 m) warmed from 1971 to 2010, and it likely warmed between the 1870s and 1971. That leaves approximately 7% to 10% of the energy to be either stored in land, ice, and the atmosphere, or to be expended in heat transfer processes such as energy used in changing elements between states such as from ice to liquid, or liquid to vapor, which involves the use of energy. Land, snow, ice, glaciers and energy transition processes (such as from ice to liquid, or liquid to vapor) are estimated to be in the 4% to 6% range. Simply put, if you want to see if Earth is warming or not you need to look at the place where most of the heat energy is going: the oceans. As shown in the image below the Earth climate system is steadily warming. Natural variation in the ocean oscillations is a key determinant factor in how much energy manifests in the atmosphere verses the ocean. When oceans are carrying heat deeper below the surface, then the atmospheric heat is removed by transference processes of wind, current and radiative transfer. One of the obvious key components that drives such changes is in the largest body of water on Earth: the Pacific ocean. When the Pacific Decadal Oscillation (PDO) is positive, the Pacific ocean transfers more heat to the surface, which transfers more heat to the atmosphere. 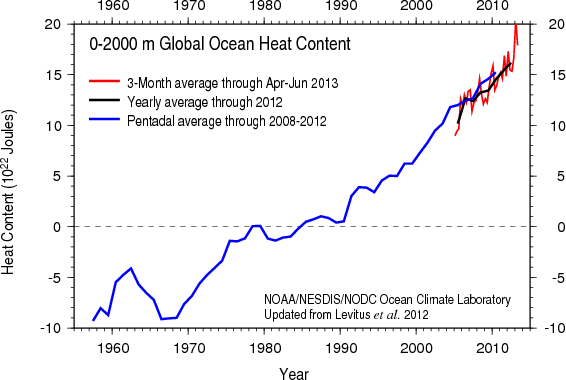 When the PDO is in negative phase more heat is transferred to the deep ocean from the atmosphere. This typically cools the atmosphere. For context, the PDO has been relatively negative between 1998 through current (2013). Generally speaking, evidence indicates that the Earth atmosphere should be cooling. It is not. It is remaining relatively stable. Many are confused about why the atmosphere is not warming but in fact the answer is relatively simple. Heat is always moving around in the climate system between the atmosphere and the ocean systems. That is the chief cause of short term temperature variation on the intra and extra-decadal scales. Some claim a pause in the atmospheric temperature rise means that global warming has stopped or paused. In fact this 'pause' signal may be best interpreted as warming because normally when the PDO is negative it causes 'global cooling' in the atmosphere. This also may mean that when the PDO does turn positive, we can expect more heat than normal to be released to the atmosphere since there is much 'extra' heat in the oceans now. That would likely translate to a further acceleration of the hydrologic cycle (increasing potential intensity in precipitation events: snow, rain, hail, sleet). The most likely results from this heat transfer (during a positive PDO) will be warmer atmospheric temperatures, more floods, more intense rain storms and thus more infrastructure damage in areas where appropriate infrastructure hardening has not been implemented. "We have estimated an increase of 24 x 1022 J representing a volume mean warming of 0.09C of the 0–2000 m layer of the World Ocean. If this heat were instantly transferred to the lower 10 km of the global atmosphere it would result in a volume mean warming of this atmospheric layer by approximately 36C (65F)." There is an old saying, what goes up must come down. In this case, we need to consider that what goes down will eventually come up. Not all at once of course, but as mentioned above, when the PDO goes positive, we can likely expect a significant change in the atmospheric heat content as heat energy is transferred from the deep oceans back into the atmosphere. Citation: Levitus, S., et al. 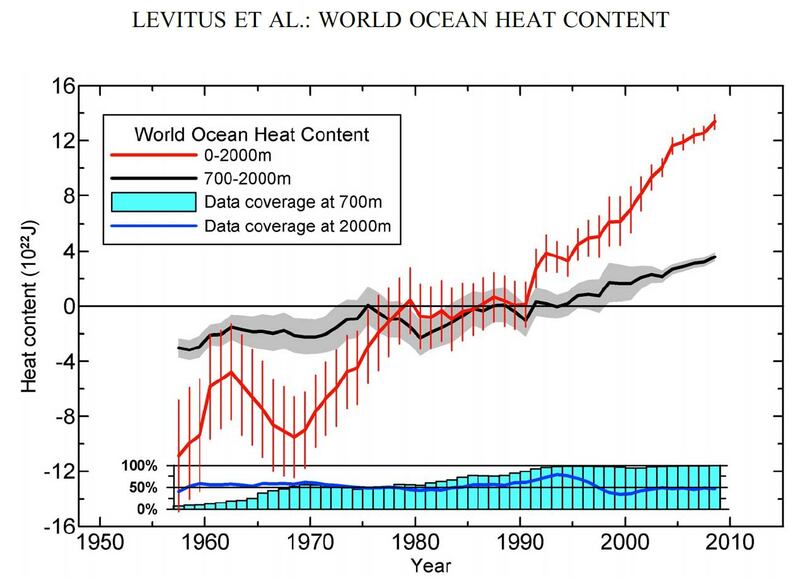 (2012), World ocean heat content and thermosteric sea level change (0–2000 m), 1955–2010, Geophys. Res. Lett., 39, L10603, doi:10.1029/2012GL051106.